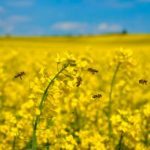 Have you already bought some high-quality bee-friendly British rapeseed oil produced while avoiding the use of harmful pesticides? If you’d like more information about the issues, you can find out more here. Halve the pumpkin/squash, peel if desired, remove seeds and cut into wedges. Peel and chop beetroot into 3–5cm cubes. Remove outer layers of skin from garlic but leave skin on cloves. Place the ingredients in a baking tray and coat with a few tablespoons of rapeseed oil, then add herbs, salt and pepper to taste. Bake for 35–45 minutes at 220°C/gas mark 7 until soft, stirring half-way through. While baking, slice polenta into 1cm thick strips; allow three per person. Heat small amount of oil in a frying pan and fry polenta slices for 1–2 minutes each side, then remove from pan. Add spinach to the pan and put a lid on to allow it to wilt over 1–2 minutes. Plate the spinach, arrange the polenta on top and serve with the pumpkin/squash, beetroot and garlic cloves. Preheat the oven to 190°C. Stir dry ingredients together and then mix in the liquid ingredients. Pour the mixture into a medium-sized cake tin which has been greased. Place ingredients in a large bowl, except the apples, extra sugar and cinnamon. Beat well with a whisk or electric beater. Divide the mixture among cupcake pans. Gently place three apple wedges onto the top of the mixture. Sprinkle a little extra sugar and cinnamon on the apple and bake for 15–20 minutes until a skewer inserted into the centre comes out clean. Mix the flour, oats, salt and bicarbonate of soda together in a mixing bowl. Rub the margarine into the dry ingredients with your fingers until there are no lumps of margarine left. Pour in the soy milk and rapeseed oil, mixing them in quickly using a palette knife. Then bring the mixture together with your fingers with the minimum of handling. Shape the mixture into a flat-bottomed loaf about 20cm in diameter. Place the loaf on a baking sheet and cut across the top in both directions to make it cook through evenly (don’t cut too deep, though, as this may lead to the loaf breaking up). Bake for 35 minutes, after which the surface of the loaf should be dry to the touch and sound hollow when tapped. Cool on a wire rack under a tea towel to stop the soda bread drying out.